There are eight mandapams located at various spots - the Dharmaraja, Kotikal, Mahishasura, Krishna, Pandava, Varaha, Ramanuja and Shiva mandapams. In these rock cut mandapams, there are sculptural reliefs depicting various stories from epics and mythology. In this mandapam, the scene of child Krishna holding aloft the Govardhana hill to protect the people of Gokulam from severe rains. On one wall is depicted the scene of Goddess Durga mounted on a lion, destroying the evil asura with a buffalo head, Mahishasura. 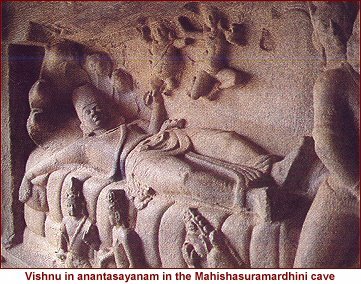 On the opposite wall is the scene of Lord Vishnu in repose (ananthasayanam) on the serpent Adisesha. Two avatars of Lord Vishnu can be seen in this mandapam. On one wall is the scene of Lord Vishnu as Varaha (with a boar head), lifting Boomi Devi from under the ocean. 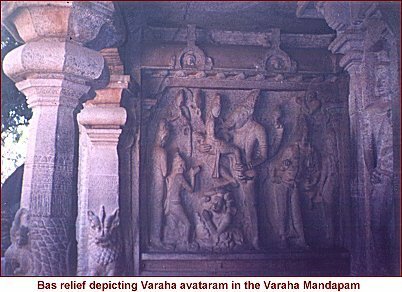 On the other wall is the scene from Vamana avataram (dwarf brahmin boy).